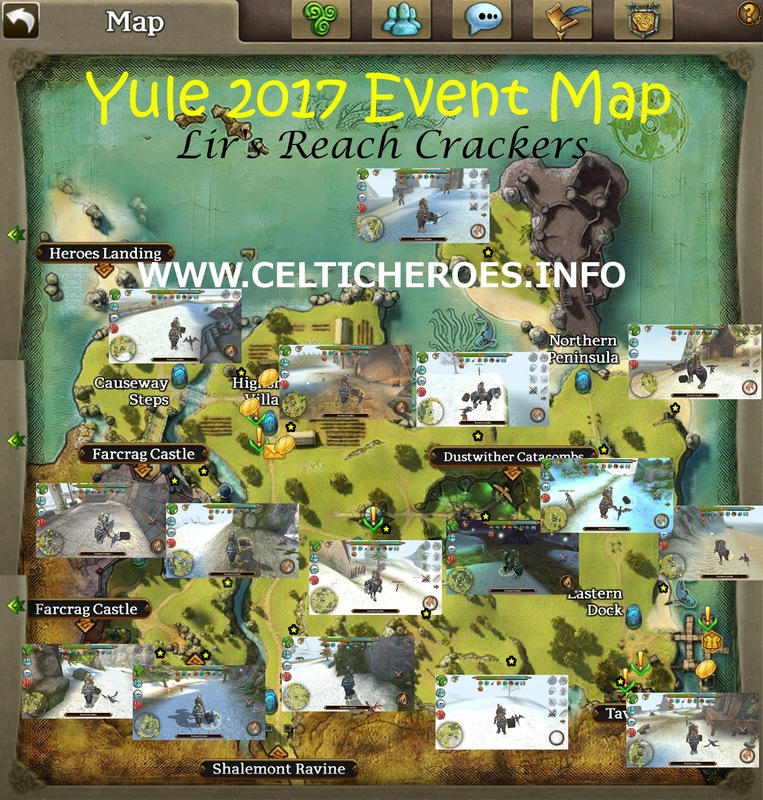 This is your guide to the Yule 2017 Winter event in Celtic Heroes that started December 18, 2017. I'll be showing you new quests, chests, mounts, fashion and the first ever competition along with maps and info about each part of the event. I will be adding more to this guide as more info is uncovered. Check back often! Harsh snowstorms batter the ramparts of Farcrag Castle as the Dor Keln snows reach our shores. 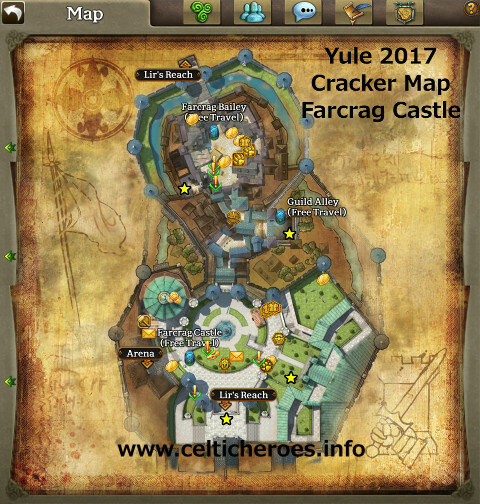 The lands of Lirs Reach, Farcrag Castle and the Arena have got a bit chillier this season. Remember to wear your mittens! Snow is on the ground and falling from the sky! Return of the festive hat quest! Visit Meirich Colgach in Farcrag Castle to begin your festive quest for the Cheerful Jester's Hat! Reward: a hat that is "styled after the garb of the famed performers of the MacLir Royal Court." The Cheerful Jester's Hat fashion hat that comes in regular or lustrous hats that sparkle. 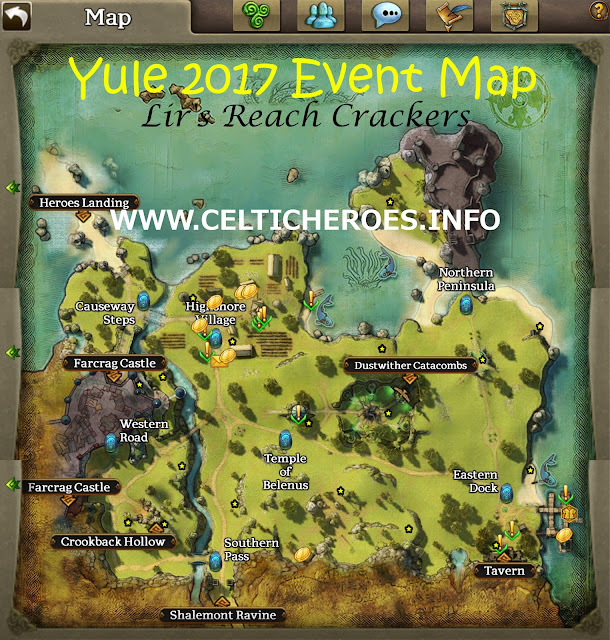 You will need to gather festive crackers from chests in Lir's Reach, the Castle, and the Arena. At the end of the quest, you will have turned in 2555 Festive Crackers! Firebreath and Aeon chests have been combined! This will include 2 new fashion sets, Aeon fashion, the jackpot Dragon Eggs and more! We will be reducing down to one chest. There will be some seasonal content in the chest. Other content will remain throughout the year. 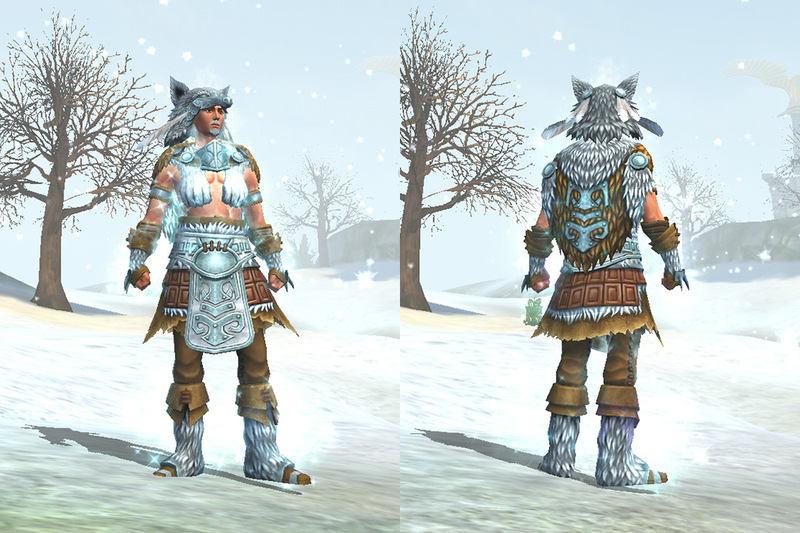 Shaman Fashion - The fashion vendor in Farcrag Castle has acquired an exotic new fashion from a far-off land. Bring them fashion tokens. They will happily exchange their wares with you. 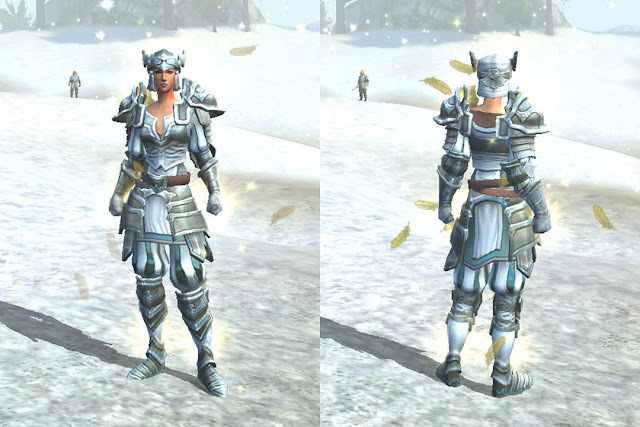 Seasonal Vindicator Fashion – A chest exclusive fashion! 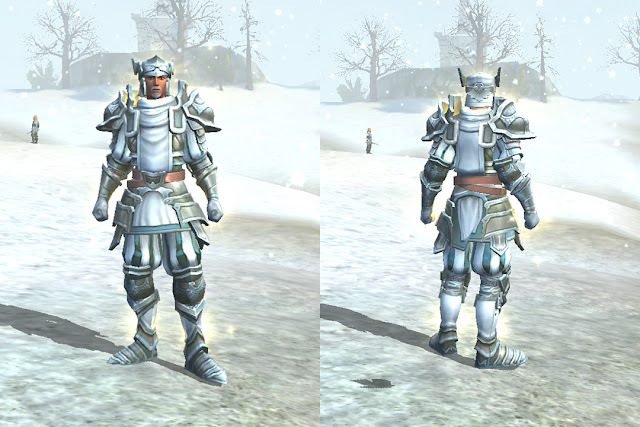 Open Snowstorm Chests for a chance to receive this proud knight fashion! Vindicator Fashion will only be available during the Winter Season. 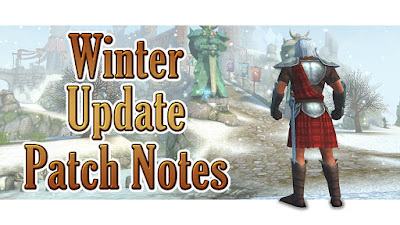 It may return in future winter updates. A festive barding for your Battlemount! Obtainable via the Snowstorm chests, these will make any battlemount shine with Christmas spirit. *Only available during the Winter season! 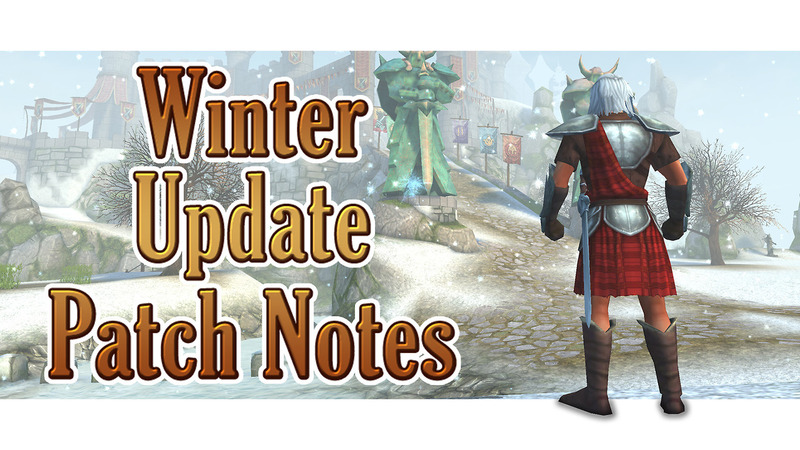 May return in future winter updates. Become the man with the finest facial hair in all Dal Riata, Auctioneer Padraig MacLir. Obtainable via Charm Tokens. Valiant hunter, sharp eyes, razor talons. The perfect battle companion. Thranduil would be jealous. Magnificent watcher of the forest, the Elk Battlemount. Gives Focus, Vitality, and Evasion (Spell/Movement/Wounding) boosts. 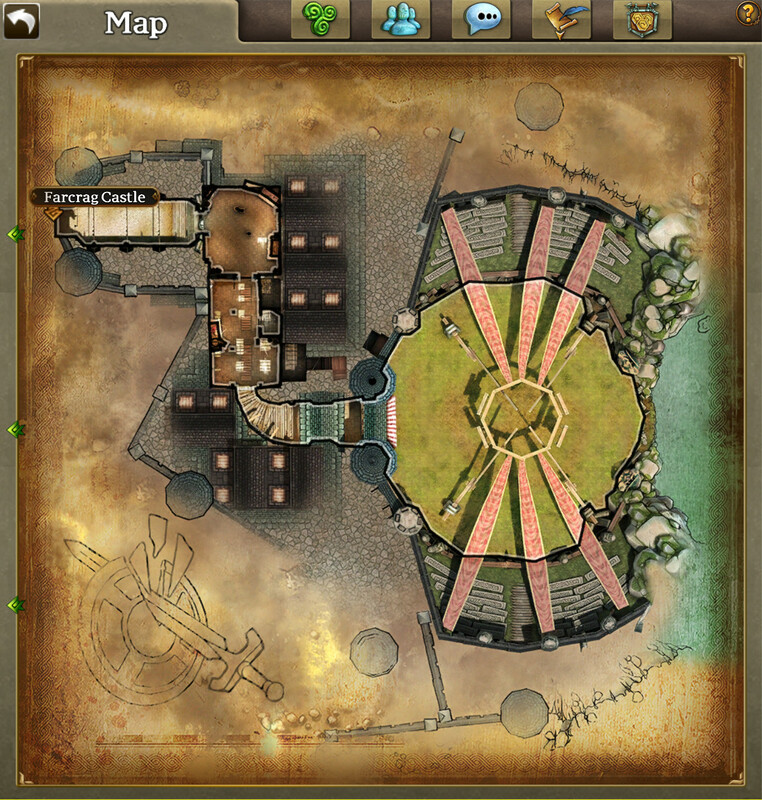 Lord MacLirs’ castle has received another revamp! The arena has received a grand makeover fit for the majesty of Farcrag Castle. 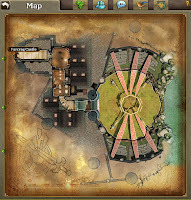 Visit to challenge any who dare fight in arena combat. The lord has not been the only one busy. The dark lair of Dustwither Catacombs has twisted into a fearsome land of the dead. Be wary travelers of these lands. This begins the 18th of December at 16:00 GMT and concludes on the 21st of December at 16:00 GMT. You should receive a warning 30 minutes before the start of the competition, and a popup when the competition officially begins! The competition will track the new fish that has invaded Lir's Reach, the "Ling". 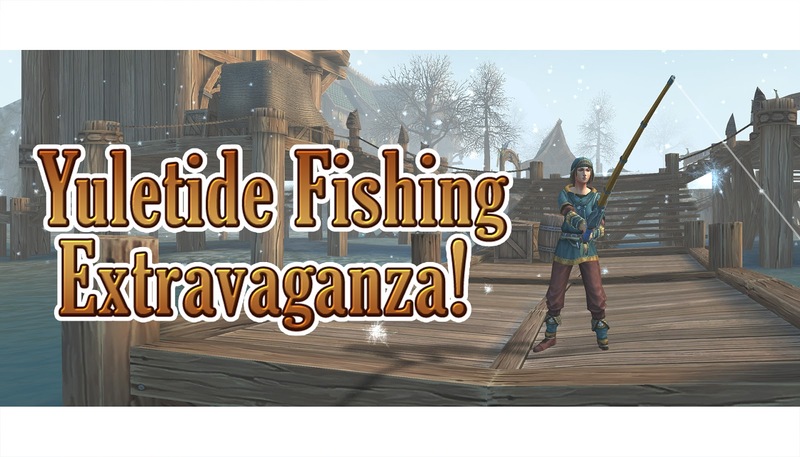 These fish can be caught from any of the new Glacial Waters fishing spots throughout Lir's Reach, and when you actively perform the action of looting this fish, your total will increment on the new Competitions leaderboard between this specific time period, and only during this time. Although the leaderboards will display data for all servers, players will be able to filter by world on the main page to see the progress on their specific server. Also, take note that the leaderboards are currently slow to update. So don't stop fishing until you receive that final popup saying the competition is over! You'll never know until the end. 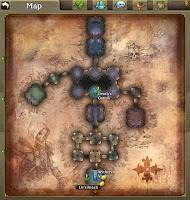 Once complete, we will provide the rewards on each server via in-game mail, hopefully by Friday. Sound effects for walking have been updated. Different terrain, different sound! 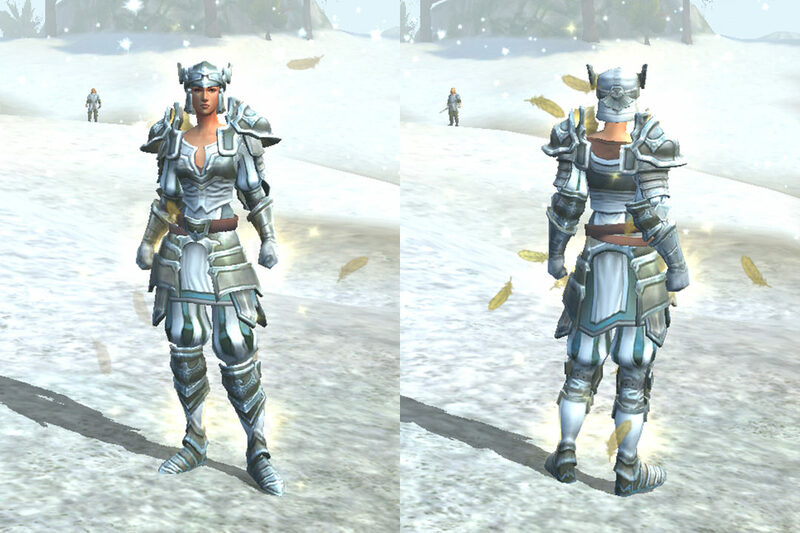 Cooking Fashion Vendors have now been corrected for Purple and Turquoise variants. Samurai fashion no longer clips on sit emote. Clan creation timeout bug, fixed. Exotic fish now have correct visual appearance when caught. Mage wand weapon effects positioning, fixed. Giant Dragon Hatching no longer clips player model. Cream of Carrot soup requirements, fixed. War Horse breeding requirements, fixed. 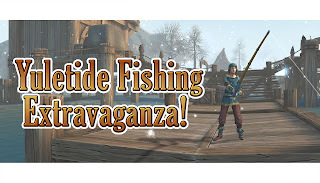 Pets idle animation while fishing, fixed. Dire bat in tunnels can no longer fly into a new realm of existence.